For full information on fishing in the Brecon Beacons just click on the link and you will be taken to a full overview. You will also find information on obtaining your Fishing Passport by clicking on this link. It’s a good idea to get your passport in advance of arrival so that you can start to fish without any problem. The Caerfanell River runs through the village into the River Usk, and has small pools for fishing. 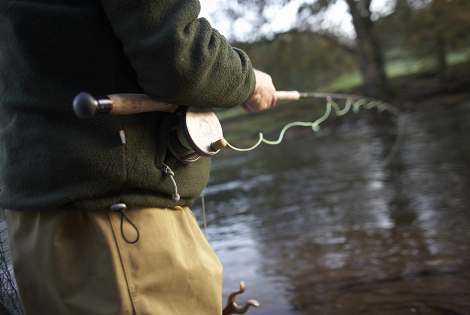 The River Usk is just below the village (fishing is available on request) and is only a short walk away. Talybont Reservoir is retained as a wilderness fishery and contains a population of wild trout that are carefully supplemented by restocking with brown trout only. Fly fishing is the only permitted method and six fish may be taken in one day. Small imitative patterns are recommended. There are no evening tickets. No fishing is permitted from the dam at the Northern end, although you can walk across it to reach the other shore. Boats are not permitted. The season extends from mid-March to mid-October and you can fish from 07.30 to 22.00, depending on the time of year. Tickets can be obtained from the automatic dispenser at the Aber camp site just below the dam (bring plenty of £1 coins). The Usk – a spate river – is an important wild brown trout and salmon fishery. Good quality sport is available from March to September. Waders and buoyancy aides are essential. There are a number of private beats available right on Talybonts door. One of them is at Ashford House and you can apply for a fishing passport to enjoy fishing here. Talybont reservoir is stocked with brown trout and day fishing permits can be purchased from a nearby ticket machine. The Canal provides fun fishing for roach, perch, dace and chub. It is ideal for the younger person, perhaps just learning to fish and looking for a safe but productive day! Environment Agency licences can be purchased from the village shop in Talybont.